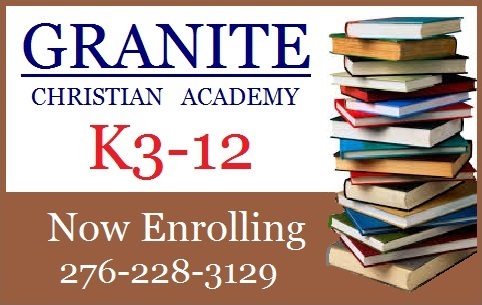 Q: Is Granite Christian Academy accredited? A: No, GCA is not currently accredited by either the state or any independent accrediting bodies. For reasons of principle, we will not seek accreditation by the state at any point. We are weighing out the potential benefits of seeking accreditation by the American Association of Christian Schools, of which we are a member in good standing. We are also members of ODACS, the Old Dominion Association of Church Schools. Our outstanding faculty does a magnificent job of preparing our students for entrance into college life. GCA has graduates that have been accepted at accredited colleges and universities such as Pensacola Christian College, the University of Tennessee, Liberty University and Virginia Tech. Q: What kind of curriculum does GCA use in its instruction? A: GCA uses ABeka, the largest Christian textbook company in the world, produced by Pensacola Christian College. Q: I’ve heard GCA teaches combined grades in their classrooms. Does this put the teacher and/or student at a disadvantage? A: Generally speaking, No, it does not present a disadvantage for either teacher or student. Obviously, every child has different learning needs, and our ultimate goal is to have each grade in its own room with its own teacher, but on the whole, our combined classrooms are organized in such a way as to give the student the same potential for success as they would enjoy in any other learning environment. We have included information specific to this question here. Q: Does GCA require the students to wear uniforms? A: Yes, GCA does utilize a dress code that includes uniforms. Students are required to wear certain colors and styles that can be easily purchased at local retailers at a minimum of expense. Q: How does GCA’s tuitions and fees compare to other Christian schools in the area? A: The tuition and fee schedule for the coming academic year is included in this packet. It is difficult to make a comparison to other schools in the area for a host of reasons. Schools operate using different curricula and approaches to learning. This may require more or less teachers and/or supervisors. Facilities may be larger or smaller and require varying expense to control climate, provide water, etc. Tuition rates change constantly to accommodate for fluctuations in the local economy, operational costs and student body size and needs. That being said, GCA has maintained the same tuition rate for the last several years and is generally lower in cost than other comparable schools in the area. A: Though we are working on potential scholarship opportunities in the future, we regret that there is currently not any mechanism for financial aid available. Q: Does GCA participate in interscholastic athletics? A: Our participation in interscholastic athletics depends entirely upon the number of eligible students available and their willingness to play. Our desire is to grow to the point that interscholastic athletics are available to our students on a consistent basis. Q: What is the process for enrolling my child/children in GCA? A: Once you have obtained an information packet, complete and return the enclosed application and schedule an appointment to meet with the Principal. During this meeting, he will further explain our entrance requirements, policies, fees, testing and required documentation.